Oreel obtained a Master’s degree in Psychological Methods at the University of Amsterdam. He worked on research applying network models and system dynamics to investigate people’s changes in attitudes and opinions. Hartog obtained a Master’s degree in Humanistic Studies, specializing in ethics, narrative identity and theories on ‘the good life’. She worked as a researcher and teacher in bio-ethics, organizational ethics and ethics of care. Drs. Netjes obtained a Master’s degree in Sociology and has participated as a researcher on different projects regarding Quality of Life and Labor participation, amongst people with chronic and/or mental illness. She participated in the study from 01-07-2014 to 01-03-2017. Stanekzai is a second year medical student at the Faculty of Medicine, University of Amsterdam. He is a participant of the ‘honours programme’ for excellent students. Drs. Van Maarschalkerweerd studied Psychology at VU Amsterdam , and obtained a Master’s degree in ‘Psychology of health behaviour’ at the University of Amsterdam. She is currently working as a research assistent for several research projects at the Department of Medical psychology, Academic Medical Center, Amsterdam. She participated in the study from 01-03-2017 to 01-09-2017. Prof. dr. Sprangers is professor of Medical Psychology, in particular QoL Research at the Academic Medical Center, Amsterdam (AMC) and Foreign Adjunct Professor of the Karolinska Institute in Stockholm, Sweden, currently affiliated with the Department of Medical Epidemiology and Biostatistics. She co-authored more than 250 papers in peer-reviewed journals that address the methodological, theoretical and clinically applied aspects of QoL research in a range of chronic diseases, including cardiac disease. She is an international expert on response shift and co-established the international GeneQol consortium to study the genetic basis of QoL. Prof. van Laarhoven is professor of Translational Oncology at the Department of Medical Oncology of the AMC. She obtained two PhDs: in Medicine and in Religious Studies. One of her research lines specifically focuses on improvement of QoL in cancer patients. She co-authored more than 100 articles in international peer-reviewed journals. Dr. Henriques is an interventional cardiologist and head of the catheterization laboratory at the AMC. He is specialized in acute myocardial infarction therapy and is the (co-)PI of various studies in the field of PCI. He has a special interest in cardiogenic shock and chronic total coronary artery occlusion and recently completed a study on anxiety in PCI patients. He is member of the scientific board of the Acute Cardiac Care Association. Dr. Scherer-Rath is associate professor at the Department of Empirical and Practical Religious Studies of the Radboud University of Nijmegen (RUN). He was director of education (2007-2010) at the Faculty of Religious Studies. His research line is embedded in the program ‘Cognitive Humanities’ of the Research Institute of the Faculty of Philosophy, Theology and Religious Studies at the RUN. He is an expert on the contingency theory. Dr. Nieuwkerk is assistant professor at the department of Medical Psychology of the AMC/UvA. Her areas of expertise include QoL, patients’ treatment preferences and patient adherence to medical treatment recommendations. She authored papers in high-impact journals (e.g., JAMA, Arch Int Med, AIDS). Prof. Willems graduated as a physician and a philosopher. He is professor of Medical Ethics at the AMC. He is member of the Council for Public Health and Health Care (RVZ) and the Health Council (GR). His over 150 peer-reviewed papers target normative questions related to health risks, advanced home care technology, and care at the end of life. Prof. De Mol obtained two PhDs: in law and in medicine. He is professor of Cardio-thoracic Surgery, vice chair of the Heart Center and chief of Cardio-Thoracic Surgery, at the AMC. He co-authored over 170 peer-reviewed papers. He has a part-time appointment at the Eindhoven University of Technology as professor of Biomedical Engineering. He is a regular invited speaker at meetings on safety in health care and the development and application of biomedical technology. Prof. Mulder is professor of cardiology in the AMC and specialized in adult congenital cardiology. In 2001 she initiated the national registry and DNA bank for congenital heart disease in the Netherlands. She chaired the European Survey on congenital heart disease. From 2010 until 2012 she was president of the International Society of Adult Congenital Cardiology. Since April 2013 she is incoming president of the Netherlands Society of Cardiology. Dr. Van den Hout is an econometrician / health economist and senior researcher in Health Technology Assessment, at the department of Medical Decision Making of the Leiden University Medical Center. His more than 85 international papers focus on economic evaluations, either alongside clinical trials or using mathematical models, methodological aspects of measuring utilities and costs and on disease modelling. Dr. Joore obtained a Master’s degree in Epidemiology and a PhD in Economics. She is associate professor in Health Technology Assessment, and has extensive experience in health economic evaluation. She has co-authored over 70 papers in peer-reviewed journals. 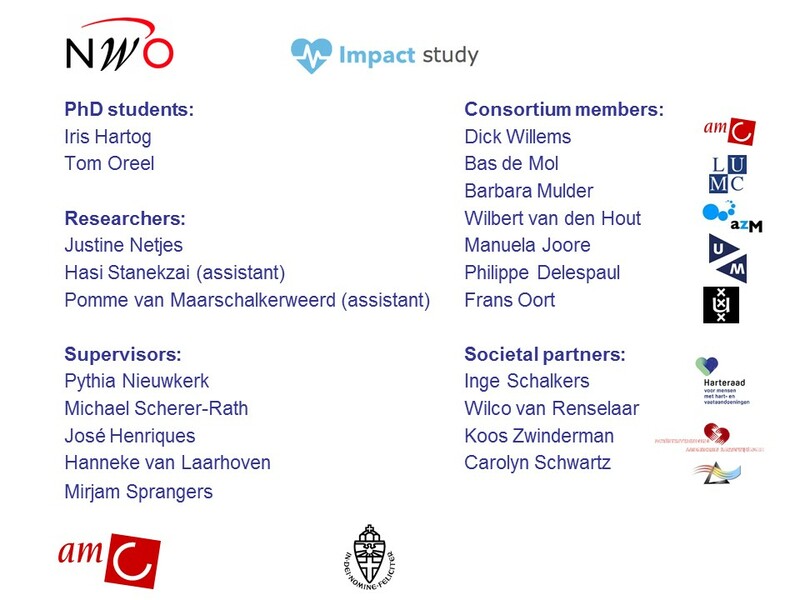 In 2009 she received a grant for a methodological study on the measurement of momentary experienced health-related QoL using EMA from ZONMw (project completed February 2012). Prof. Delespaul is professor for Innovation in Mental Health Care at the Medical Faculty of the University of Maastricht. He is a clinical psychologist, trained in psychological methodology and statistics, epidemiology and behavioral therapy. He is an international expert on Ecological Psychiatry, mental health service development and psychosis. He is a pioneer of EMA and for more than 25 years an international consultant in the field. He contributed to over 100 peer-reviewed international journal articles. Prof. Oort is professor of Methods and Statistics and Director of the Research Institute of Child Development and Education at the Faculty of Social Behaviour and Sciences of the University of Amsterdam. He is also Director of the Research Priority Area Yield. He co-authored approximately 200 peer-reviewed international journal articles and is an international expert in SEM and response shift.